Poison and Cheap Trick will be touring together for over a month this coming summer. The two bands will be joined by the group Pop Evil. 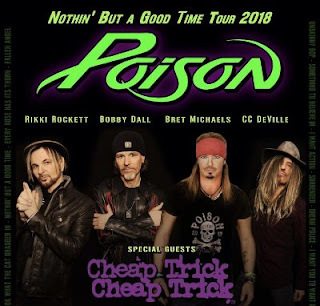 From press information, it appears that the tour is being headlined by Poison with the other two bands opening. Dates run from May 18 to June 24 with tours going on sale this weekend. Check with your local venue for ticket availability and on-sale date/time. Cheap Trick are scheduling a packed year with their own headlining dates, an appearance at Rocklahoma and the Poison tour followed by another trek with Def Leppard and Journey.